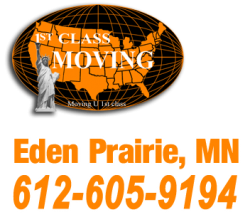 1st Class Moving can provide packing services with your move. Our packing services are the most affordable you’ll find in the moving industry. We know it’s the little things that count during your move and that’s why we take such special care to pack your things the right way because no one likes broken furniture. Remember, careful packing is one of the most important things you can do to safely move your furniture and belongings. Our experienced, skilled packers will ensure that your belongings are carefully and safely packed using protective packing supplies such as bubble wrap, packing tape, paper and other special packing materials if needed.